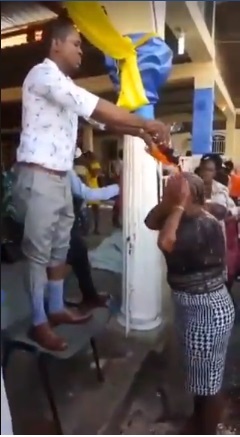 Friday, April 12, 2019 - This pastor is trending after he poured sodas on his brainwashed followers claiming that they were receiving anointing. A video going round shows the brainless ‘Chrisitians’ rushing to the pulpit to receive anointing from the rogue man of God. He was lying to them that the anointed sodas which he poured to them could heal all diseases. These rogue men of God should be tamed.